The Fellowship was fortunate enough to obtain a copy of BURNING FIELDS #1 from BOOM! Studios. The story is written by Michael Moreci and Tim Daniel, illustrated by Colin Lorimer, colors by Joana Lafuente, and lettering by Jim Campbell. Chicago cop Dana Atkinson receives a visit from her former Commanding Officer Nelson Kendrick. He needs her help in investigating a series of bizarre murders in Kirkuk, Iraq. The clues lead to an oilfield owned by the Verge Company, which is being overseen by a man called Decker…someone who was responsible for Atkinson’s downfall. She decides to go after receiving a “special visit.” Meanwhile, things are not too friendly between the people of Kirkuk and the Americans. And another murder victim has been found on the oilfield…. I knew I was interested in this book when I heard Michael Moreci and Tim Daniel (who also wrote CURSE) were behind this. The story gets intense pretty quick; you know something bad is going on and the stakes are high. Colin Lorimer’s art creates a dark and moody atmosphere; no matter whether you are in Chicago or Iraq. This is an impressive start to a mystery that’s very topical and political. It’s really worth checking it out. 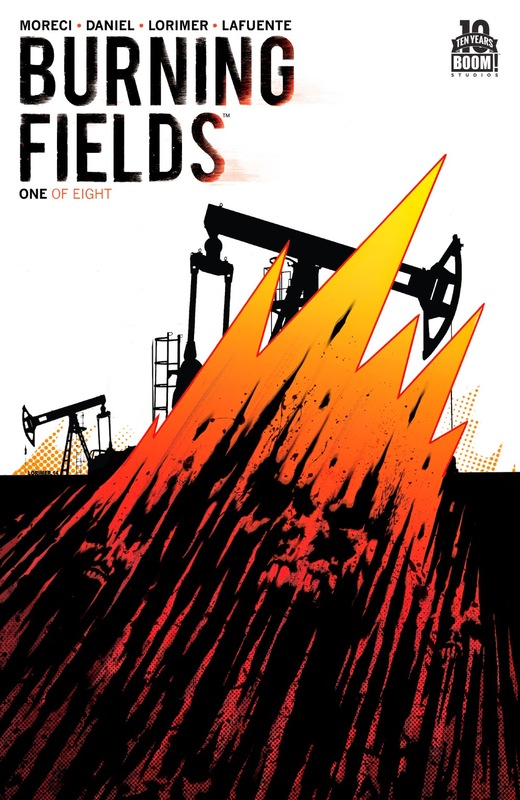 BURNING FIELDS #1 is in stores now, or available for ordering at www.boom-studios.com.